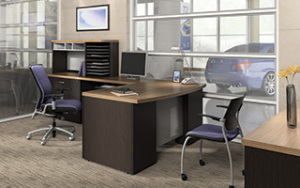 The Office Furniture Store manufactures a wide array of products in a variety of styles and finishes to suit your every office need. Are you working long hours sitting on an uncomfortable office chair? Here’s the place to choose your most important work tool: your new office chair! Find the best used office chair for you, one that will fit both your body and tasks you do at The Office Furniture Store. Our highly varied office furniture catalogue is designed for small and medium size companies that wish to acquire commercial quality office furniture at affordable prices. Large companies that purchase considerable volumes of office furniture, as well as the self-employed and individuals, can fulfill their needs with a vast choice of office furniture of a quality much superior to that of traditional office furniture retailers.